In Reader's Theatre (1), I described Reader's Theatre as a great way to have kids interact with a story, as well as develop their imaginations. In Reader's Theatre (2), I revealed the Book Chook method for turning a piece of literature into a Reader's Theatre script. Such scripts make a wonderful project for families, Sunday School and Boy Scout groups, or whole classes to create. That creative process involves many literacy skills, and can be another way to link to the literature kids are reading. Picture books, traditional tales, and fairy tales all make accessible sources for these created scripts. Now I want to discuss how I introduce a Reader's Theatre script to a group of children. Remember, Reader's Theatre can be used simply as a script to read aloud, with as few as two people to take all the parts, and no props or costumes. But I prefer it as a piece practised for performance in front of an audience. If I want to use a script I've already written with a group of kids, the first thing I do is read the story aloud that the script is based on. Ideally, I do that several times as well as initiate activities that help kids get to know the text really well. Then I explain the concept of Reader's Theatre. For young ones, this could be as simple as "Let's make a little play about this book." I introduce the script, reading it aloud with great expression, fluency and enjoyment. We become familiar with it. In a classroom, that would happen in Guided Reading sessions over a couple of days. Group or chorus reading follows, with each child having his/her own scripts by now. Once parts are chosen or assigned, a highlighter helps readers keep track of their own parts in a script. If kids aren't comfortable reading their part alone, they might choose to partner-read. 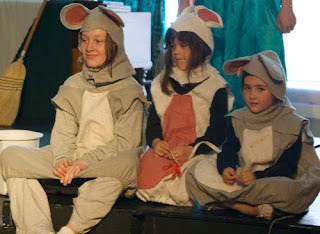 Even though children can read from their scripts in a performance, they need plenty of opportunities to practise their parts so they develop fluency. Memorization is not necessary for Reader's Theatre, but some kids will have a whole script by heart in a blink! Humour is always appreciated by audience and readers in activities like this. You can enhance the humour already present in a story by using exaggeration. If I were using the snippet of script I wrote about The Three Bears (see Reader's Theatre 2) with a group, I'd encourage the characters to think how they can best portray big, middle-sized and tiny with body movements and facial expressions. I'd have the chorus decide on the voices, actions and facial expressions they're going to use to accompany their lines ahead of performance, so that the audience is presented with a group "Awww" that exaggerates its silliness. Children often have good ideas for props or costumes that produce a smile. Does Papa Bear constantly have to hold his too-big trousers up? Could we use a thimble for Baby's bowl? Once everyone has had a chance to develop individual fluency, practise as a group. Communication is the key! Make sure kids develop the habit of facing the audience when they read. Remind them not to cover their faces with scripts, and never use masks that cover the whole face. With older children, encourage them to look at the script only when they need to, so they engage eye contact with audience members. Clear speaking is essential, but may need to be enhanced with microphones, depending on the acoustics of your venue. Everyone tends to speed up when they're nervous, so I have my kids build in conscious breaks at commas and full-stops. All of the above sounds very serious and important, and I believe these are core communication skills we should encourage. But don't forget to have fun with Reader's Theatre! It truly is fun, and just because the Book Chook way is to nudge it towards Opera House standards, doesn't meant that is the best way for you and your children. In Reader's Theatre (4), I'll discuss different ways of using Reader's Theatre. http://bit.ly/9ikfTd : Finally, my next post in the Reader's Theatre series, Reader's Theatre (3). Great way for kids to read fluently. My students really enjoy Readers Theater. They often ask if they can turn something we are reading into a Readers Theater. Even my shy students and struggling readers get into it, it gives everyone a place to shine and interact with reading. Yes it does, Kelly. I love it for fluency and for the fact it is an ensemble effort, with slower readers supported by quicker ones. Love to think of your students asking to turn their reading material into any kind of theatre. Drama rocks!